We dispatch within one business day! Classic Iron-Ons - Ultra performance iron-ons for socks, underwear and tagless t-shirts. 1.5" x 0.5". Shoe Shields™ - Clear, protective covers for Applied Labels™. 1.8" x 0.6". When your camper comes home, ensure all of their stuff does too! Our camp packs include labels that are personalized, ultra-durable and commercial dishwasher and laundry safe. The labels work on everything from water bottles to clothes to shoes. Classic Iron-Ons are included for items without tags such as underwear and socks. Labels in the camp pack are neat, sleek and coordinated. Get a cute, elegant or block look with one of our three fonts and 16 icons. Classic Iron-Ons: Place label text side up on the fabric. For Polyester Uniforms and Athletic Materials, simply trim your Iron-On label down if needed and then iron it directly onto the clothing tag. Clothing Backers: Step 1 - Place the blank backer behind the tag, sticky side up. Step 2 - Align the printed label and press, with sticky sides together. Shoe Shields™: Simply apply the name label to the inside, flat heel area of the shoe and press firmly. Center the Shoe Shields™ label over the name label and press firmly. For video instructions, please visit our Instructions and FAQs page. Our camp label packs are a complete package for all the labels your kids will need for camp. The camp label packs contain a variety of adhesive and iron-on labels. 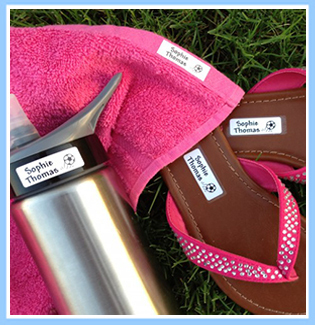 These tough camp labels will remain on your child's belongings all camp season and longer.